At Thanksgiving, we tend to eat our carbs with a side of even more carbs: buttered rolls, mashed potatoes, and stuffing all topped with gravy. If you’re watching your carbohydrate intake, you’ll want to re-evaluate what constitutes a “staple” of the Thanksgiving spread. These ideas for low carb Thanksgiving sides offer new options as well as fresh takes on the classics. Enjoy a delicious holiday meal without cheating on your diet (or filling your fridge with dangerous leftovers!). Mashed potatoes are a Thanksgiving favorite, but if you’re on a low-carb diet, you’ll want to swap them out. Mashed cauliflower has a similar taste and texture with a much lower carb content. (It takes less time, too!) Steam and mash the cauliflower, then season with garlic, herbs, butter, salt, and pepper to taste. Making traditional gravy involves adding flour to meat drippings in order to achieve the desired texture. But if you’re willing to be just a bit more patient, skip the flour. Simply stir the drippings over heat with a little extra broth and a splash of balsamic vinegar until the liquid reduces to the gravy-like texture you know and love. Traditional green bean casserole often includes a breadcrumb topping, or a starch as a thickener. Go lighter and fresher this year (but still get all the flavor). Coat green beans in a little olive oil and garlic, toss in grated parmesan, and bake for 12-15 minutes at 425F. The result is a crispy, cheesy, low-carb Thanksgiving side that everyone can enjoy. 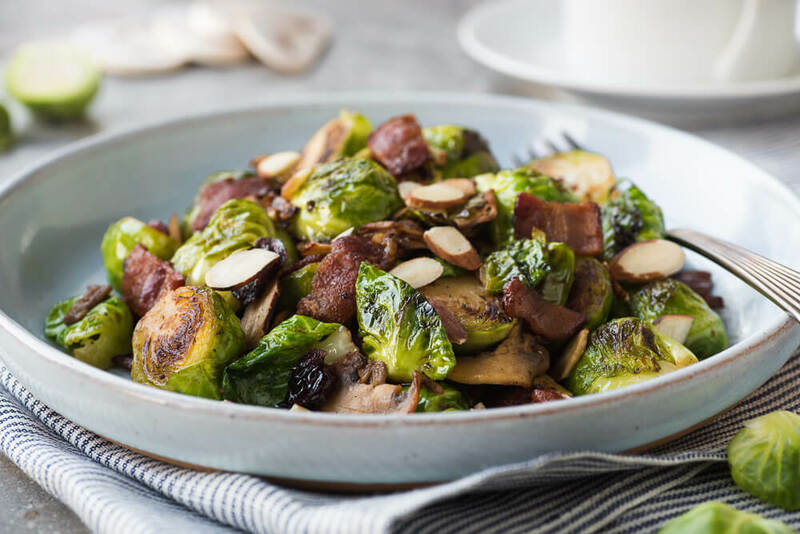 Brussels sprouts are another easy, low-carb Thanksgiving side. Toss halved sprouts in olive oil and balsamic vinegar, then roast in a pan with pine nuts and parmesan. Add some bacon or pancetta if there are no vegetarians at the table! It’s as simple and delicious as it sounds. Wrap the asparagus in strips of bacon and bake at 400 degrees F for 10 minutes. Serve for the main meal, or enjoy as an appetizer while everything else is cooking. Another appetizer-or-side option! Instead of stuffing your mushrooms with breading, fill them with a mixture of Italian sausage, cream cheese, and chopped mushroom stems. Rolls or biscuits are a Thanksgiving staple that are hard to give up. To opt for a low-carb version, try out a recipe that uses almond or coconut flour instead of wheat flour. Some recipes will also use beaten egg whites to help give low-carb biscuits a fluffier texture, like this one from Create Delicious. Homemade soups capture the comfort of Thanksgiving dinner without the extra carbs--plus,the liquid content keeps you fuller longer. Pureed broccoli and cauliflower make the perfect base of a healthy vegetable soup. Enjoy topped with cheddar cheese and bacon. Pumpkin isn’t just for pie at Thanksgiving! Make a savory pumpkin soup using chicken broth, heavy cream, and pureed pumpkin. Replace bread chunks with chopped eggplant to make your favorite stuffing recipe low-carb. Eggplant is a versatile vegetable that takes on the flavor of whatever it’s cooked with. When baked, the texture is not that far off from bread, either, making it an easy substitute. Want more holiday inspiration? Check out even more Thanksgiving ideas for paleo, keto, and gluten-free diets here!